If you have afro type hair, then you may find yourself struggling to find products and appliances that you can use to style your hair. If this is the case, then you will be pleased to know that there are actually plenty of styling appliances to choose from. One thing that you might want to look into is a hair dryer. Many people are not aware that these can actually be used for styling purposes too. If you have afro hair, then you will want to make sure that you choose a hair dryer which is suitable for your hair type. In order to take some of the work out of your search, we have tested and reviewed some of the best hair dryers for afro hair. Please read on below for our verdicts on some of the best on the market at the moment. 3 different styling attachments which are suitable for all different hair types. 3 speed settings and 3 heat settings makes styling easy. Very long 9ft power cord. It is fairly expensive in comparison to some of the others that we have tested. 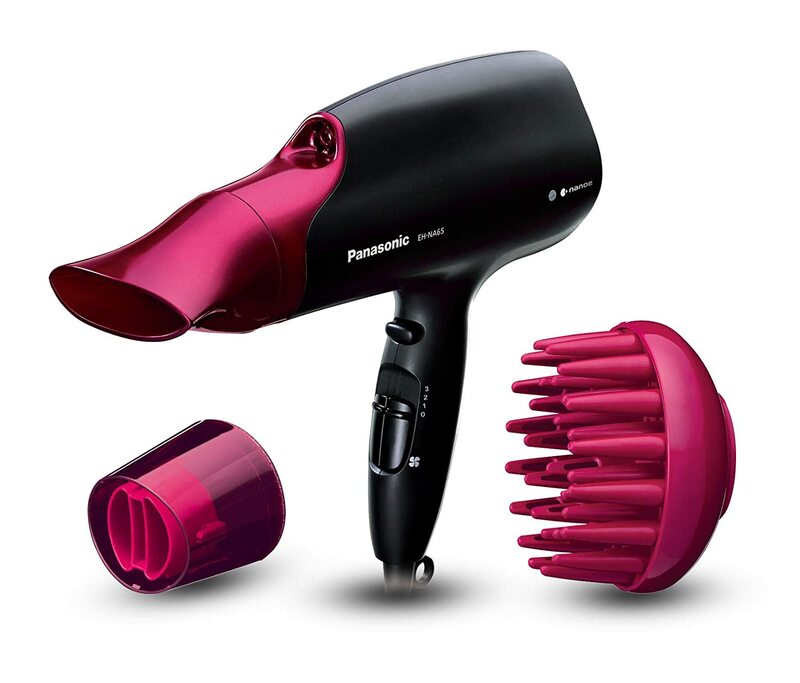 The top spot on our list of the best hair dryers for afro hair goes to the Panasonic EH-NA65. Out of all of the hair dryers that we tested for our review, this one was definitely the most impressive in terms of design as well as performance. To start off with, what immediately caught our eye was the design of this hair dryer. It is sleek, modern and very comfortable in the hand. As well as this, we were intrigued by the different styling attachments that come with it. We tried out all of the attachments provided and noticed that they were suitable for all different types of hair, not just afro style hair. There are three speed settings and three heat settings which made getting the style just right no problem at all. Something else that we liked was the cool shot function which allows you to set your style once you have dried your hair. We found this to be particularly effective. As well as this, the 9ft power cord matches salon quality; another thing that we were very impressed with. Although this hair dryer is quite expensive, we really feel that it is worth the extra money that you would have to pay and we certainly recommend it for afro hair. 5 different styling attachments including one for afro hair. Long power cord for ease of use. There is no removable filter. There are only 2 speed settings. Next on our list of the best hair dryers for afro hair is this one from PluieSoleil. We hadn’t actually heard of this brand before so we were unsure of what to expect but we were actually pleasantly surprised by it’s performance and design. The main reason why we chose to test this hair dryer is because it comes with a range of styling attachments including one that is specifically designed to style afro hair. We tried out the various settings and were quite pleased with the results. The only drawback is that there are only two different speed settings. We felt that it would be much better with a third setting. However, it does still have 3 heat settings and a cool shot function which makes up for it. The power cord is more than long enough, at 5.9ft it is plenty long enough to offer comfortable use. The hair dryer itself is fairly lightweight and surprisingly quiet too. Another downside is that this one doesn’t have the removable filter feature. 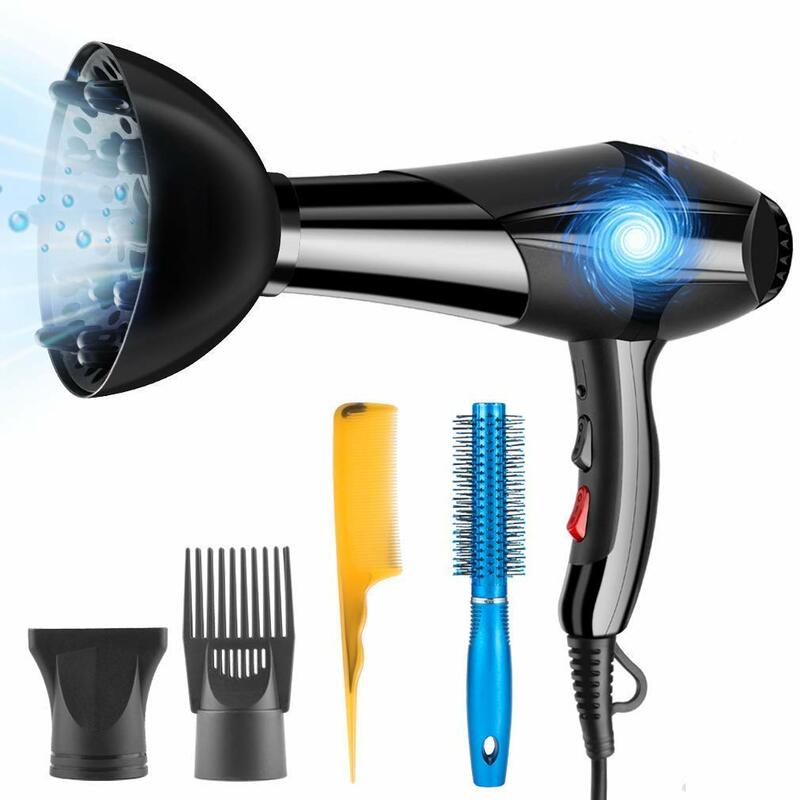 Although there are a few negative aspects, we were still impressed by the performance of this hair dryer and it is actually surprisingly affordable too, so it comes highly recommended by us. 4 Different styling attachments including one for afro hair. Has a removable filter for optimum results. The motor could be a little more powerful. The power cord could be longer. 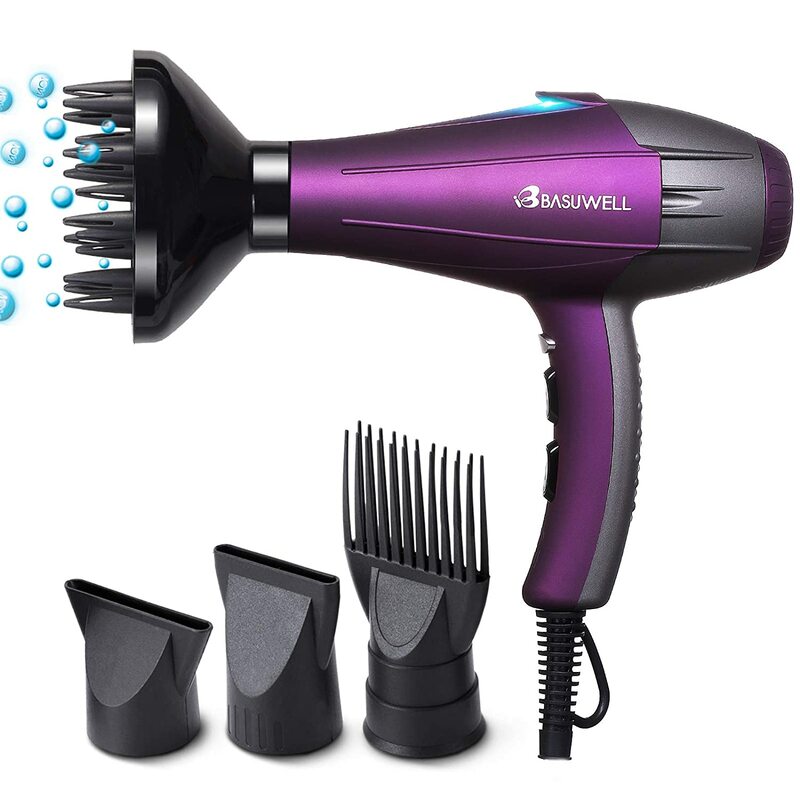 The last on our list of the best hair dryers for afro hair is this one from Bauswell. Although it reaches number three on our list, we were still very impressed with the performance as well as the design. Starting off, we were very pleased with the appearance and design of this hair dryer. It looks very much like what you would expect to find in a high street salon. Using the hair dryer is very easy and the dryer itself is really lightweight. The noise levels are fairly standard for a hair dryer in this price range and there are four different styling attachments. We tried out the attachment for afro hair and found the results to be surprisingly effective. However, there are a few drawbacks with this Bauswell hair dryer. First of all, there is the fact that the power cord could definitely benefit from being longer. As well as this, there is the fact that the motor is only 2100w which is significantly less powerful than the previous model. Aside from this, this is actually a really good option for those looking for an affordable hair dryer for afro hair. Hopefully now that you have read our thoughts on the best hair dryers for afro hair you are now able to choose the right one for your needs. Any of these three would be a great option so take a look at them for yourself and see what you think.